Development of a product known as gecko tape has been kicking around for years, and apparently engineers continue to think that this product has potential. 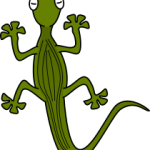 It is based on the ability of the gecko to be able to attach itself temporarily to vertical surfaces with a sort of “reusable adhesive” that let it defy gravity. Understanding how the gecko does this has led to speculation and research on a reusable, “self cleaning” tape that would revolutionize the adhesives industry. The British version of Wired Magazine has some updates on where this research is headed.